NFL Hall of Famer John Elway began his career as a two-sport athlete at Stanford. Inside the rear neck of the nylon cape is the Goodman manufacturer’s tag size “L” with washing instructions. 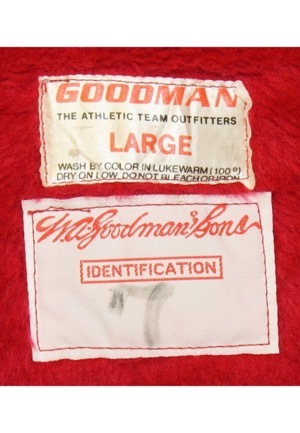 Adjacent below is an additional Goodman & Son’s tag reading “IDENTIFICATION” with the player number “7” handwritten in period faded black marker below. 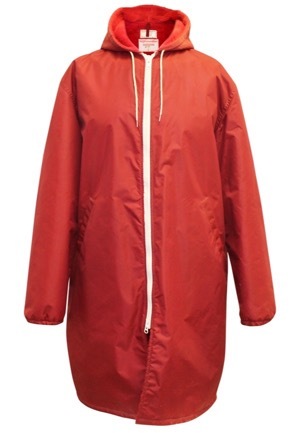 The inside of the cape is red fleece. Across the back of the cape reads “STANFORD” in white tackle twill. 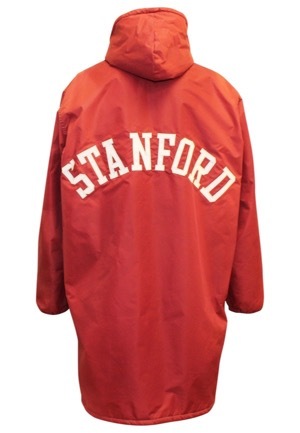 This cape is properly tagged, was presented to us as player-worn attributed to John Elway and shows use. Originally sourced from the Elway family at the 1989 East vs. West Shrine Football game. Accompanied by a field credential and photo from that game and an additional LOA stating how the cape was sourced directly from the Elway family.